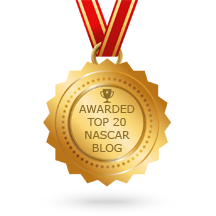 Thanks to a hard day of racing (and being the right place at the right time) Ryan Blaney advanced in the Playoffs by winning NASCAR‘s first ever ROVAL race at Charlotte Motor Speedway in the Bank of America ROVAL 400. When the green flag waived to start the race on the ROVAL every driver, team member and fan had no idea what would unfold during the race. Lap by lap the drama built in the NASCAR Playoffs elimination race. There were tire issues, spins and crashes due to handling issues. However, the drama and impact that would happen at the end of the race could not be predicted. Kyle Larson appeared to be the car to beat most of the race as he led a total of 47 laps during the 109 lap race around the Charlotte Motor Speedway Road Course. He captured to win in stage one. Ryan Blaney looked strong all day also as he was the winner in stage 2. Jimmie Johnson was looking like the seven-time-champion he is and doing what he needed to do to advance to the next round in the NASCAR post-season. He was near the front most of the time and setting himself up for a shot at claiming the win. The most important thing was that running near the front was putting him position to advance in the playoffs. Kyle Larson and seven other drivers were involved in a crash heading into turn one of the ROVAL on a late race restart. That ended his chance of winning the race and put his chance to advance in the playoff in serious question. That accident allowed Martin Truex Jr. and Jimmie Johnson to be in position to race for the win. Martin was in the lead with Jimmie right behind him on the final lap. The two drivers raced toward the checkered flag going through the chicane (turns 16 and 17) on the track just before the finish line. Jimmie drove into the feature hard and lost control of his car sending it spinning. The #48 Chevrolet spun into the #78 Toyota causing both cars to wreck just before the finish line. That allowed Ryan Blaney to race past the two cars and claim the win on the first ever ROVAL course in NASCAR history. The win was Ryan’s first win of the 2018 season and secured his spot in the Round of 12 in the NASCAR Playoffs. Jamie McMurray claimed the runner-up finish with Clint Bowyer coming across the finish line in third place. Alex Bowman finished in fourth place with Kurt Busch rounding out the top five. See the complete race results for the Bank of America ROVAL 400 here. 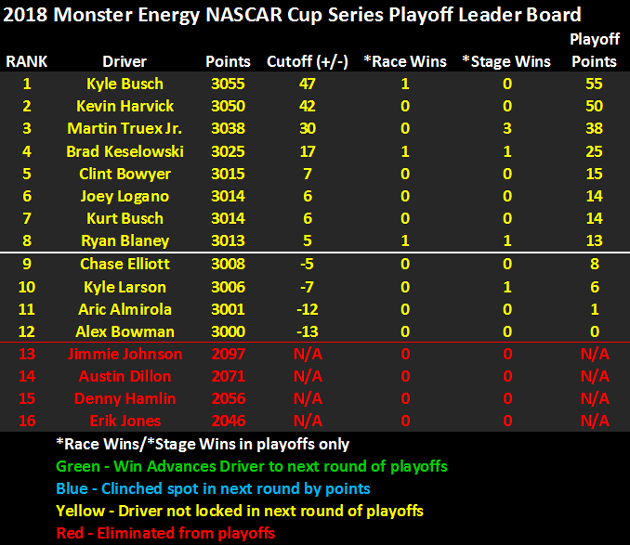 Once the race had ended there was a little bit of time as NASCAR had to figure out which drivers had earned enough points to advance in the playoffs. There ended up being a three-way-tie at the cutoff line. The tie was broken by highest finishing positions during the first round of the playoffs. It just shows that every point and every position in every race is important to the drivers and teams. When it had all been figured out Erik Jones, Denny Hamlin, Austin Dillon and Jimmie Johnson found out that they were the four drivers eliminated from the playoffs. The heartbreaking reality for Jimmie Johnson was that had he not gone for the win and accepted a second place finish he would have advanced. Kyle Larson limped his broken car around the track after his accident well enough to claim enough points to advance. Below is a look at the NASCAR Playoffs Leader Board following the first round elimination Charlotte ROVAL race. The Round of 12 begins this Sunday, October 7th in NASCAR’s Playoffs at Dover International Speedway, a.k.a “the Monster Mile,” in the Gander Outdoors 400.